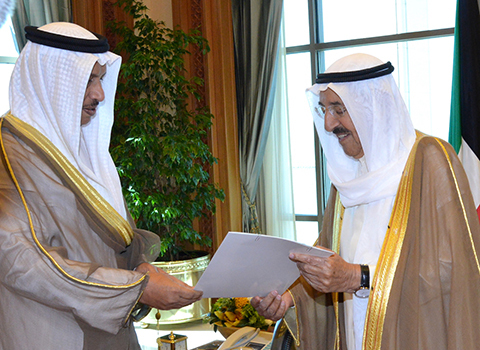 KUWAIT: Kuwait’s Cabinet has resigned and Prime Minister Sheikh Jaber Al Mubarak Al Sabah has submitted the cabinet’s resignation to the Amir, the official news agency Kuna confirmed today. No reason for the resignation was immediately given but is likely due to ‘non-cooperation’ with the parliament after lawmakers last week grilled State Minister for Cabinet Affairs and acting Information Minister Sheikh Mohammed Abdullah Al Mubarak over the government’s alleged failure to abide by the national budget and to implement legislation. If confirmed, this the resignation comes less than a year after the government was formed. The National Assembly is schedule to hold two sessions on Tuesday and Wednesday to discuss a vote of no confidence against Minister of State for Cabinet Affairs and Acting Minister of Information Sheikh Mohammad Abdullah Al-Mubarak Al-Sabah. According to the agenda, the parliament will vote on the no-confidence motion, submitted by MPS Shuaib Al-Muwaizri, Waleed Al-Tabtabaie, Mohammad Al-Mutair, Abdullah Al-Roumi, Hamdan Al-Azmi, Mubarak Al-Hajarf, Thamer Al-Dhefeeri, Riyadh Al-Adasani, Jamaan Al-Herbesh and Omar Al-Tabtabaie.